As an exclusive event venue, The Granary is designed to accommodate weddings, soirees, and events with elegance and ease. A stunning backdrop of the rolling foothills and fields of the Shenandoah Valley creates a beautiful private setting to be experienced from both the interior and exterior of The Granary's shiplap and stone walls. Our Taproom hosts a stunning cast concrete bar and high-topped tables for cocktail hours and private social events. The Granary is proud to serve locally sourced and carefully curated wines and beers from the Commonwealth; however, the bar selection is fully customizable to cater to our client's preferences. The inclusivity of The Granary's amenities for weddings and gatherings enables a remarkable ease for planning and coordinating any event. Reservation of The Granary includes privileged use of the 4,000 square foot event space, its adjacent taproom and portico, and an al fresco terrace anchored by a fieldstone hearth. For weddings at The Granary, separate bridal and groom's suites are provided exclusively, complete with private restrooms, crystal chandeliers, and the softest natural light for getting ready and every in-between moment. The Granary's open floor plan hosts up to 200 guests with plenty of space to dance. The venue is flexible for seating arrangements and can be spatially designed to meet the bride and groom's preferences. Whether you are hosting an open bar with an array of options or a set limit simply with your favorite beers and wines, The Granary provides options for complete customization of your wedding's bar menu. Our bartenders will work to coordinate the perfect selection for your wedding day. The Granary offers private suites for the bride and groom, designed with natural light and spacious open plans for the comfort of our couples and their wedding parties as they get ready. Both suites include private restrooms, vanities, beautiful crystal chandeliers and stunning, neutral decor. The exterior portico is complete with lights, an integrated sound system, discrete fans, and a stone hearth for your comfort. The Portico offers picturesque Shenandoah Valley views of rolling farmland to set beautiful scene for any wedding or reception. 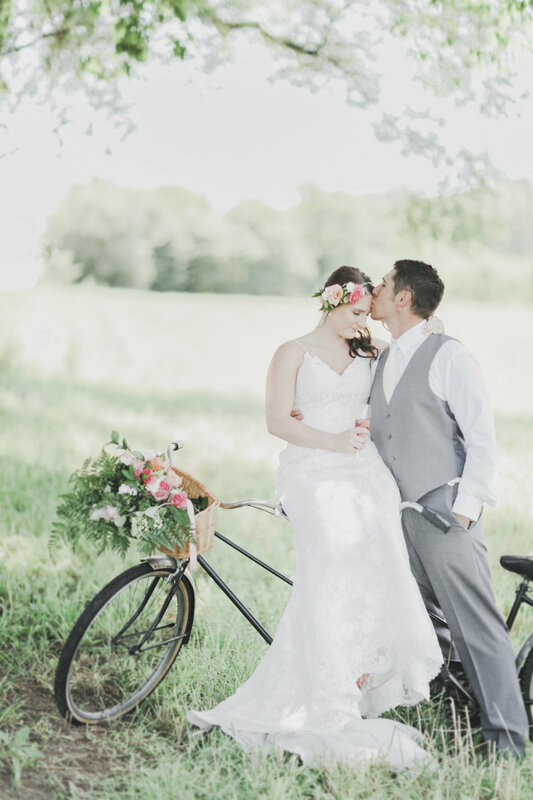 The Granary looks out on beautiful fields, perfect for an outdoor ceremony. Our wooden wedding chairs can be placed in any arrangement, and the ceremony site can be handpicked by the bride and groom. Exclusive time of use on the day of the wedding will begin at 10:00am and conclude at 10:00pm. Additional hours can be reserved a la carte. Please inquire for multi-day reservations and custom packaging. 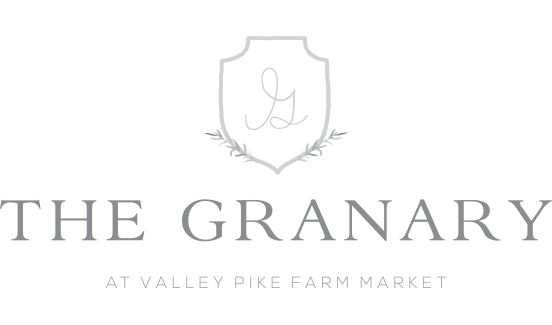 As a premier event venue located at Valley Pike Farm Market, The Granary is available to reserve seven days a week for weddings, private parties, conferences, and company gatherings. The venue hosts a maximum capacity of 200 people, and reservation of the space includes the use of the exterior portico, the hearth and patio, and The Taproom. Conveniently located just off of I-81, The Granary is an incredibly flexible space for hosting any event, from rehearsal dinners and weddings to cooperate events and large meetings. With an open floor plan, an integrated sound system, and thoughtfully designed natural lighting, The Granary is the perfectly conditioned space for an array of large or small events. The Granary is home to a full taproom, with an astounding array of local Virginia wines and craft beers. 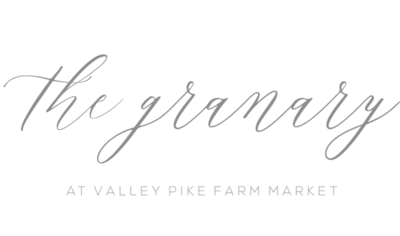 Through Valley Pike Farm Market, your bar menu can be fully customized, from the beers on tap to the wines we pour, whether they're local or from outside of the Commonwealth. Bartenders are available through The Granary, and we are delighted to coordinate and assist in the selection of your menu. The Granary is pleased to provide up to 30 round tables and up to 200 wooden event chairs for your guests. The Granary allows for indoor events and ceremonies, whether it's preferential or due to inclement weather! With such an open plan, The Granary allows for multiple arrangements for seating and event layouts.